Continental Tyres are well-known as one of the world’s leading premium tyre manufacturers. The company’s expertise, however, doesn’t stop there. 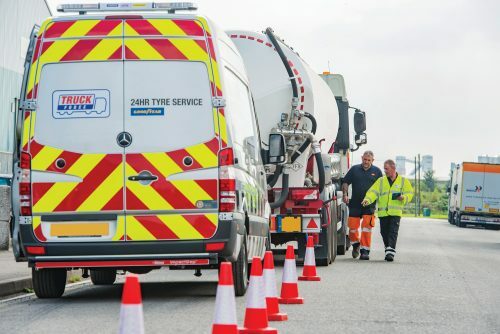 With tyres influencing approximately 40% of operating costs for commercial vehicles, Continental offers a range of additional solutions to help operators achieve the lowest overall driving cost for their fleets. ContiFitmentService ensures operators make the right tyre choice, while premium regrooving and retreading services focus on extending the life and mileage of tyres. The ContiPressureCheck tyre pressure monitoring system (TPMS) allows operators to improve fuel efficiency and ContiBreakdownService minimises downtime in the event of tyre failures. 1 Tyre selection The right advice helps fleets to select the best tyre for their individual needs. Operating costs can vary greatly depending on the tyre used. Tyres with optimum efficiency and reliability will improve tyre life as well as fuel costs. 2 Inflation pressure Incorrect tyre pressure is one of the greatest causes of excessive tyre wear and leads to irregular wear patterns. This reduces performance and fuel efficiency, decreasing the tyre’s life and increasing running costs. Under-inflation causes increased flexing and heat build-up, consequently damaging the tyre. Over-inflation makes the tyre more vulnerable to cuts and shock damage. The optimum air pressure gives tyres the precise shape for slow and even wear. If tyres are constantly 20% under or over-inflated, this could decrease tyre life by 30%. Running tyres below optimum pressure increases fuel consumption and has a negative impact on the environment – 20% under-inflation can result increase fuel consumption by up to 3%. Fleet operators should ensure tyres are checked once every 14 days or 2,000 miles. Tyres should be checked when cold with an accurately calibrated tyre pressure gauge. A vehicle should never have different pressures across an axle. Tyre pressure monitoring systems (TPMS) help to maintain the correct pressure. Sensors fitted within the tyres provide more accurate information on the condition of the tyre. 3 Regrooving and retreading Regrooving extends the mileage of the tyres and help manage costs. Most modern truck tyres are designed to be regrooved. To ensure casings are not damaged, regrooving should be carried out when the tyre tread depth reaches 3mm. Regrooving can extend a tyre’s life by 20% – 30%. Once the new tyre has worn to the point of removal, only 20% of the original material has been used. All ContiRe tyres are ‘bead to bead’ retreads, meaning that both the tread and sidewall rubber are replaced. The tyre looks as new and the cost is significantly lower than the cost of a new tyre. 95% of the original tyre’s performance is maintained, reducing tyre operating costs. Retreading also offers substantial environmental benefits. Every ContiRe uses just 80% of the raw materials needed to manufacture a new tyre and saves 68 litres of oil, 44 kg of rubber and 182.24 kg of CO2 compared to a new tyre. 4 Tyre care Steer axle tyres often wear more on the outer shoulder. Once the difference between the inside and outside tread groove is greater than 4mm, a tyre service provider should turn the tyre on the rim to extend its life. The diameter of twin tyres must be as near equal as possible. Tyres with a difference in diameter of more than 5mm will experience irregular wear. Tyres should be checked on a daily basis to detect safety or durability issues. Issues include punctures, cuts, foreign objects and distortion. Cracks or bulges may suggest that the tyre components have separated. 5 Irregular wear The tyre tread must be continuously monitored for signs of irregular wear. This is caused by factors such as maintenance, road hazards, wheel alignment and conditions. The type of irregular wear will provide a clue to its cause. TPMS constantly monitors tyre pressure to avoid irregular wear caused by under or over-inflation. 6 Tyre repairs Damaged tyres must be inspected by a tyre expert before any repairs. Tyre service providers can decide if the tyre should be repaired and whether it would be safe to use after repair. 7 Breakdown cover In the event of tyre failure, ContiBreakdownService minimises downtime. This Europe-wide service is available 24 hours, 365 days a year. The Conti360° hotline provides immediate assistance in the relevant language. Continental covers a large number of European countries with maximum downtime guarantees of either three or four hours.